Any time hundreds or thousands of people gather in a single place, public safety and information dissemination becomes a chief focus of event organizers and operators. American Signal Corporation (ASC) sets the precedent for outdoor alert systems and today, remains the authority on mass notification solutions in whatever capacity it’s required. From outdoor music festivals to stadium sporting events, ASC is pleased to provide siren rental services to customers of all types. Our breadth of products and flexible rental options are designed to meet and exceed your demand for mass notification. 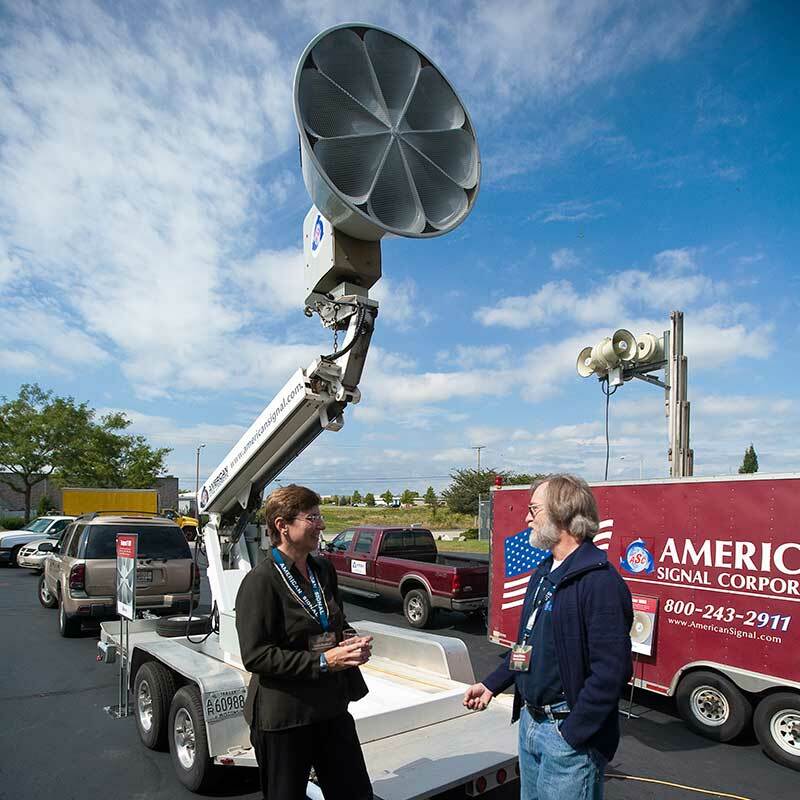 No matter if it’s a single siren mounted on a pole or trailer, or multiple mobile siren deployments, we offer weekly, monthly and long term-rental options to fit your needs. ASC’s ability to instantly implement outdoor alert systems allows us to support venues of all sizes and purposes. Whether for inclement weather alerting at a golf course or alerting spectators to an active shooter situation at a concert venue or any public settings, our systems are a standalone option for any and all public safety messages. Industrial and defense customers can also reap the benefit of a mobile ASC outdoor notification system. When industrial plants shut down for deep maintenance or a system changeover, ASC mobile sirens offer an instant solution to safety and emergency communication concerns. We’re here to keep you safe at all times. Utilizing loudspeakers, lights, sirens and more—in conjunction with sophisticated digital technologies—ASC assists customers in meeting their outdoor alert systems needs. Our solutions are encompassing and versatile, including tone and voice messaging options that deliver clear mass notifications in various outdoor settings. ASC puts the power of far-reaching communication in your hands in a way that’s convenient, affordable, yet undeniably captivating when put into action. To learn more about any of our outdoor alert systems or to consult with one of our experienced service technicians about rental terms and rates for your event or venue, please contact us today.